It's not long abandoned, he gave a post on September 1st of this year mentioning a Halloween update. Hello once again, it is the time of year for updates. As is the occasional tradition, I've made a video showing off the latest progress, although this one is only focused on the graphics. Give it a watch, and then come back for the rest of the update. I hope you enjoyed the eight new work in progress portraits shown off! As the video title hints, these are (almost) all bosses from the original game. Of course, if you have a keen eye, you may notice that one of the characters is not actually a boss! That person will in fact be a new playable character, filling in for the lack of axe users. Now, let's talk about some low-key but important gameplay changes going forward. The first is the introduction of "rusted weapons". One thing that's been worrying me in the back of my mind while working on this project is whether or not the player will ever end up in an unwinnable state. And with the repair feature, there's always the possibility that someone mismanages their funds and ends up in a situation where they have no weapons or money to buy weapons! (This has happened on someone's FE6 playthrough. Names will be withheld.) To handle this situation, the game will try to detect when you're low on money and weapons, and if you happen to be in the danger zone, you will receive a bundle of weapons free of charge! Of course, these weapons are not worth much, so don't bother selling them in an attempt to earn money. The next change is the removal of the Restore staff. At a glance this might sound like a controversial change, but there will still be ways of curing status effects in the game. The main reason for removing the Restore staff is that it's not a very interesting item, since you only deploy it for narrow situations. Instead, healing staves will now (tentatively) act as Restore staves if the affected unit is at full health. This is still undergoing testing, so it might not stick in the long run but I believe it's a push in the right direction. Another major change added is giving mercenaries (and heroes) waterwalking. This change is mainly to aid map design; having pirates as the only waterwalking option means there's little variety when it comes to adding seabound reinforcements. Having mercenaries as an option should shake things up a bit, and yes, this means that in future releases, Holyn will be able to swim. To cap off the update, the Swiftspear has been changed to give the Astra skill to the wielder, instead of Clarity. It turns out that very few lance users in the game actually benefit from having +20 avoid, and having it give Astra instead gives some incentive to tweak their inventories to make the most of it. Daccar looks like a total tool now and I love it. Looking forward to Holyn competing in the Jugdrali Triathalon next time I play! If I may ask, how is the lovers system gonna work? Well I've played and beaten 3-3 and ive really enjoyed this game/hack so far my only real issue is chapter 1-1 with kinbois, if you .could get rid of the steel axe he uses as the hand-axe he has was the only one I could find in the game and I lost it be.cause he targeted Arden with it. It was kind of annoying to not have a ranged option for lex, but that's just a peeve of Mine. is this hack still active? Yep! Last update was Halloween, with no mention of stopping. Wow you really nailed andorey, his face looks great in GBA. Are there any indications in which we know 2 characters are in love? I can't seem to see any. Is this done and being polished or are some chapters not done yet? Looking forward to giving this a shot! I haven't played FE4 so it'll be exciting! If the video wasn't clear about what the new mechanic is, I'll explain it here: The game now supports limited inventory in shops! Shops are now able to carry specific items that can only be bought once, on top of items that can be bought repeatedly and items that can be repaired. There is still some minor work left to make it clear what category the items fall under, but the functionality is fully working (and let me fix some minor bugs that repairing introduced.) As you might expect, this will open up some new options when it comes to adjusting the power curve of the game. Unfortunately, I don't have anything else to add for this update. I may write a summer update if I have something interesting to show off then, but otherwise I will see you in October. Thanks for your patience! The lovers system will be implemented using the existing support system, similar to how the modern 3DS Fire Emblem games have handled them. Haha, the goal of the Kinbois chapter is that you need to kill Kinbois without letting him attack your units to get the handaxe. Now that the new shop mechanic is implemented, however, I will likely add some handaxes in later shops. There will likely be something once I begin integrating supports. Currently, the chapters cover about 25% of the original game content. Also it's nice to confirm that Quan, Ethlyn, Finn, and Giorno can exist in the same universe and truly exist as Piller Men(and Woman). Small issue I noticed. Well, not really small, but probably easily fixable. On chapter 1-1 there is a house that, when visited gives a character infinite movement. No I am not kidding. It's the house to the right of the village that gives you the flame scroll. Just thought I should mention it, since I had to replay after Lex decided to just Yeet off the map. mmm ok what a pitty, surely your version looks good... What I meant with adapting was --> Remaking them, or adapting gba sprites to look like the ones of SNES with a GBA style... but well, no problem with that, I'll have to do it myself, no need to share credits hahahaha.... Just a little doubt concerning your last updates, since I'm not able to apply the patch (don't know why every rom I have is not possible to be overwriten with the patch), how many chapters (From the original FE4) have you already remade?? 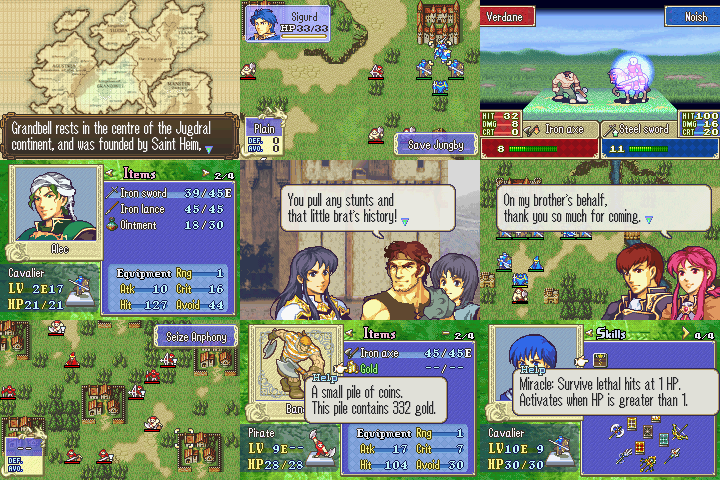 how many chapters (From the original FE4) have you already remade?? Frey's not the creator, he just responded to your post.